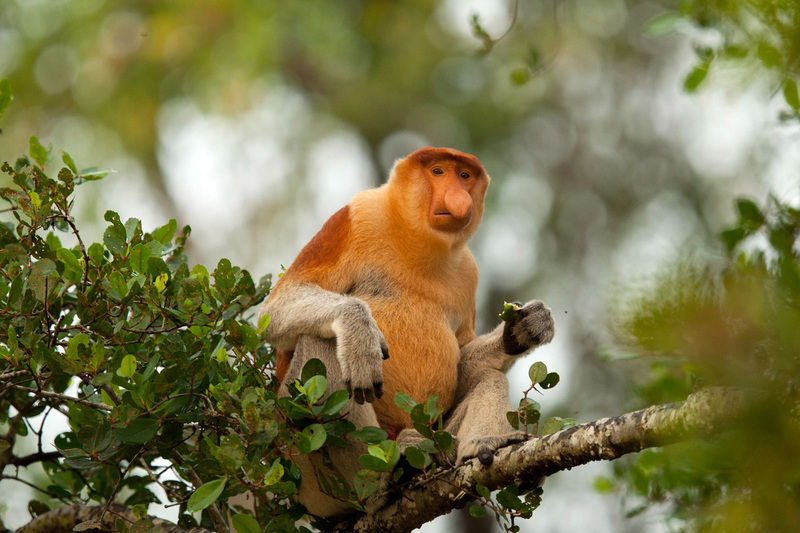 Once called the "Dutchmen" because of their large noses and large bellies, proboscis monkeys live only in Borneo. Ecosystems that have a lot of diverse animals, like this monkey, also tend to have a lot of diverse viruses. 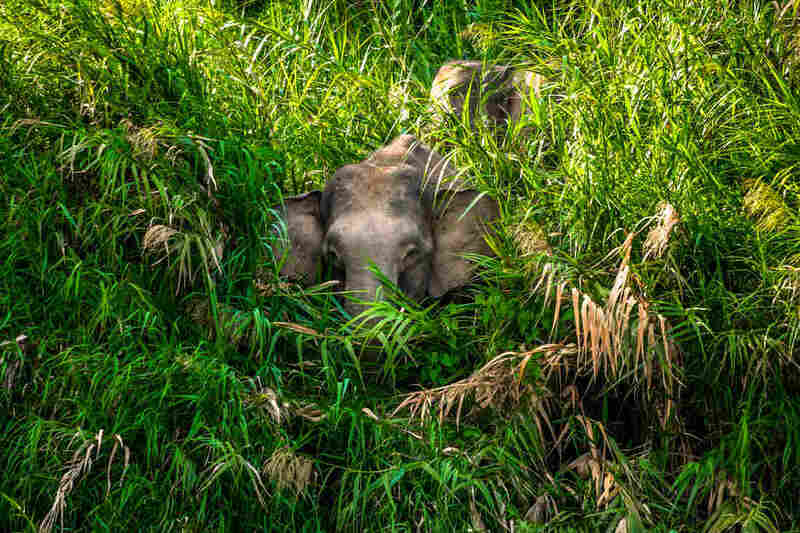 Pygmy elephants. Monkeys with noses the size of beer cans. And a deer so small you could cradle it like a baby. And right there, sitting on a leaf, is the strangest bug we've ever seen. "Check out the size of it," says virus hunter Kevin Olival as he picks up a ginormous roly-poly. "It's the size of a ping-pong ball!" We're in the middle of Malaysia's Borneo rain forest. Olival has brought us here because this is the type of place where pandemics are born. HIV came from a rain forest. So did Ebola. Yellow fever. And Zika. 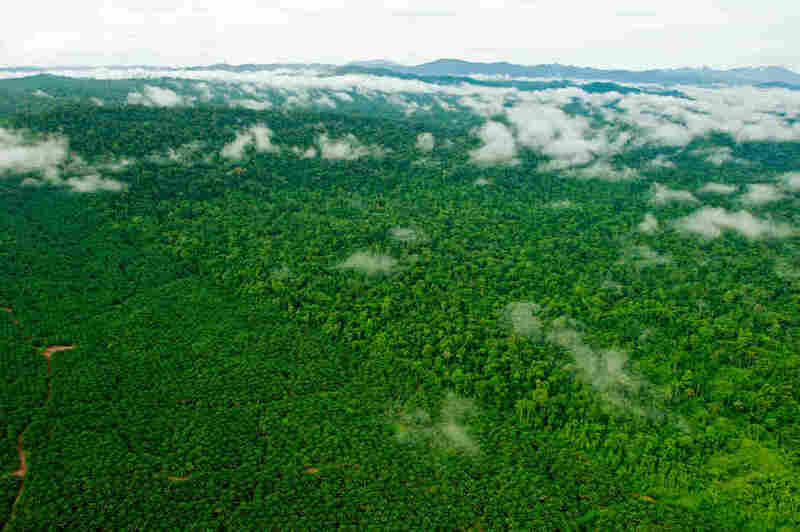 The next troubling outbreak could come from a rain forest like this. And a big reason why: all the crazy animals that live here. Rain forests are the world's secret laboratory — where evolution experiments with body shapes, sizes and colors. Maybe if a monkey gets a giant schnoz, he'll have a better time finding love? The result is a biological bonanza. "It's a biodiversity hot spot," says Olival, an ecologist and evolutionary biologist with the U.S.-based nonprofit EcoHealth Alliance. This rich diversity in the rain forest doesn't apply to just creatures we can see. It also applies to creatures we can't see. Microcreatures. Nanocreatures. You guessed it: viruses. In the U.S., we have seen more than a dozen new human diseases appear over the past 25 years. For instance, a killer tick-borne virus showed up in Kansas in 2014. A new type of leprosy dismembered a man in Arizona in 2002. And a new hemorrhagic fever jumped from rodents into people, killing three women in California in 1999 — to name just a few. 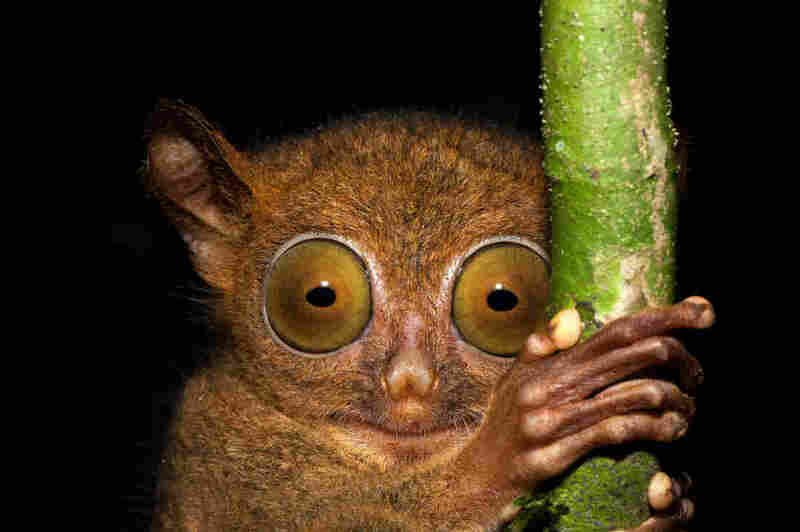 But it's the tropical rain forest that is the most worrisome to many scientists like Olival. Wearing a headlamp and a khaki shirt with the words "Virus Hunter" embroidered on the back, Olival looks like Indiana Jones' nerdy brother. He is constantly talking about how much he loves bats and admits he picked up his future wife by wowing her with his bat knowledge. But at the end of day, he is a global treasure hunter. 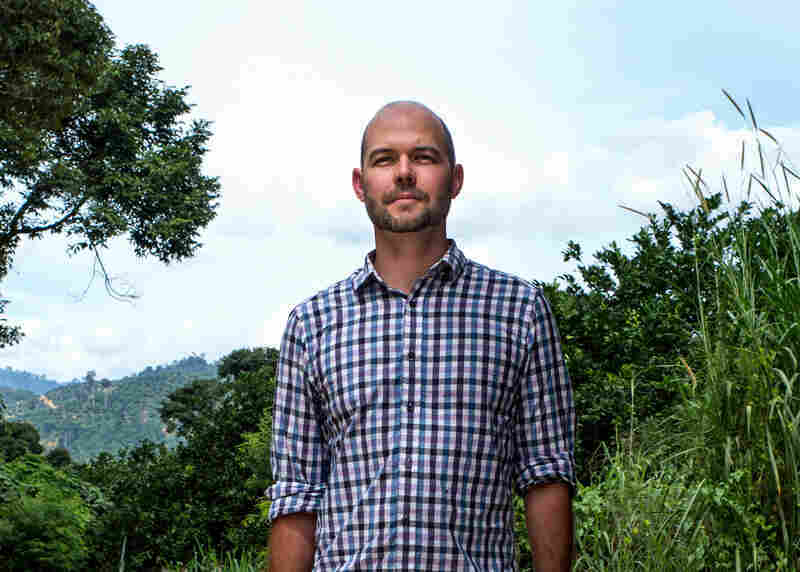 He flies around the world collecting undiscovered viruses — and he focuses his hunt on viruses with the potential to kill. It's part of a $200 million project called PREDICT, sponsored by the U.S. government and led by University of California, Davis, School of Veterinary Medicine. The goal is to figure out the viruses that are lurking inside animals around the world. So we are ready when a new and potentially harmful virus jumps from animals into people and causes an outbreak. In other words, Olival wants to find the next pandemic virus before it finds us. Olival and his team are out here in Borneo setting up traps to catch animals. On the ground, they set up little metal boxes, each about the size of a Coke bottle, to catch rodents, shrews and those tiny rabbit-size deer. And they have strung thin nylon nets high in the trees, like giant spiderwebs. Did you know? Bats are the key pollinators for more than 500 kinds of plants. They keep the rainforest alive. "We've got one," yells Olival's colleague Jimmy Lee, a virologist with EcoHealth Alliance. We rush over to one of the nets. Dangling in the middle is one of the most beautiful sights to a virus hunter: a bat. Lee puts on thick gloves and starts to untangle the bat from the net. "They can bite," he says, as he holds the little creature gently in his hands. It's not much bigger than a grapefruit. One glimpse at the bat's face, and my heart melted. "He has a little puppy face, doesn't he?" Olival asks. And it's true. The bat — a short-nose fruit bat — looks uncannily like a brown puppy. It is incredibly cute, especially as it wraps its wings around its body like a little blanket. But you wouldn't want to snuggle with this little guy. 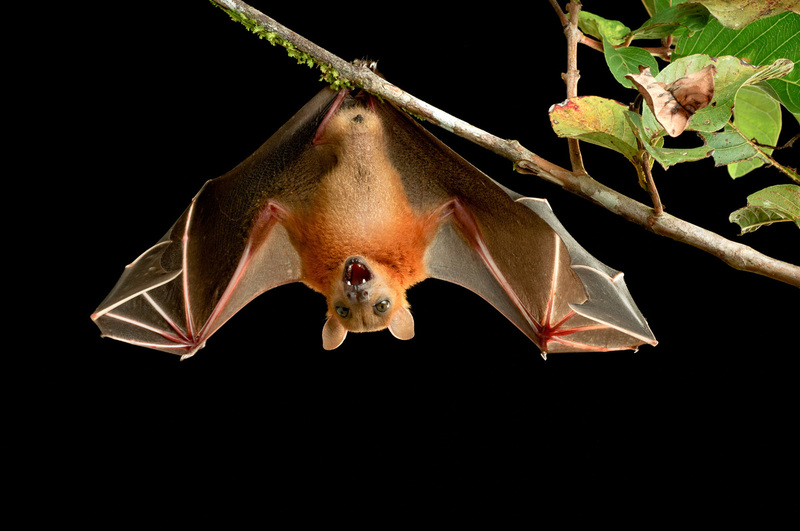 Bats are arguably one of the most dangerous animals in the world. They carry a daunting list of killer viruses. They likely triggered the Ebola outbreak in West Africa. They very likely launched a pandemic of killer pneumonia back in 2003, called SARS. And they're behind one of the viruses scientists think could cause a nasty pandemic: Nipah. So if bats are such a problem, why not kill the bats? "Not a good idea," Olival says bluntly. "Bats do a lot of good for the environment. A lot." Without bats, the world wouldn't have rain forests. Bats are key pollinators for more than 500 species of flowers and trees. They disperse seeds for many other plants, and they keep insect populations in check with their arthropod-rich diets. As we learn a bit later, bats really aren't the ones to blame when it comes to creating outbreaks. It's the intruders into their homes that are the problem. 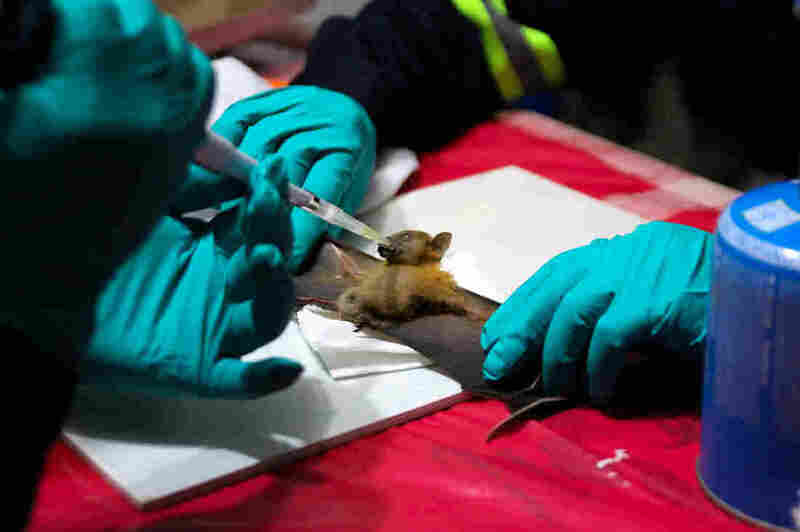 Olival and Lee lay the bat on small table, gently spread its wings open and then prick it to get a few drops of blood. They also take a smidge of saliva and then do a quick rectal swab. "That's the worse part," Olival chuckles. Then they let the bat go. 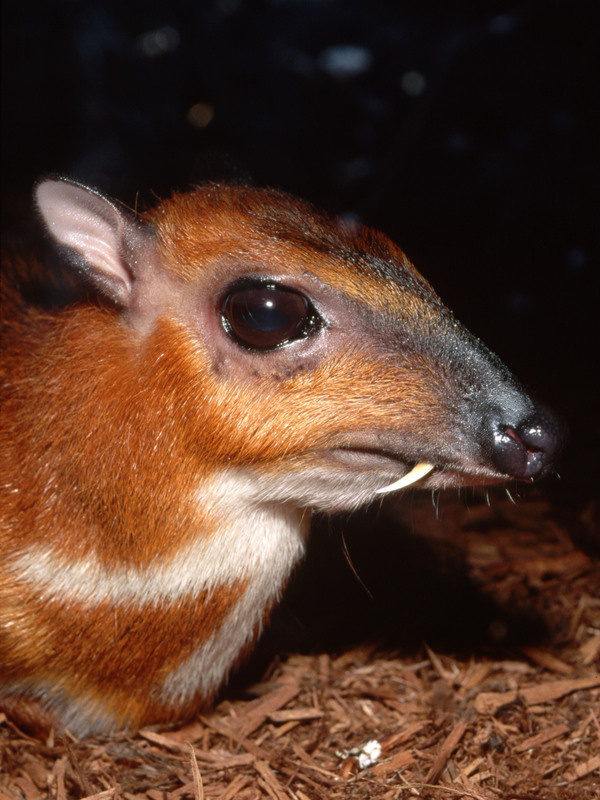 This Malaysian mouse deer is no bigger than a rabbit. Lee puts the samples in test tubes and drops them into liquid nitrogen. He'll take them back to the lab, extract genetic material to see if any of it looks like something they haven't seen before. So far, Olival and Lee's team, have trapped and sampled more than 1,300 animals in this region of Malaysia, in partnership with the Sabah Wildlife Department and Danau Girang Field Centre. Globally, the PREDICT team has sampled more than 74,000 animals. Not everyone is a fan of the project. Some infectious disease scientists think creating a long list of viruses isn't very helpful. They say money could be better spent on diseases we actually have now instead of trying to guess which ones might become a problem someday. "I don't think the actual premise for the PREDICT project — that it will make us better prepared for a pandemic — holds water," Osterholm says. For example, in 2012 scientists predicted that the deadly H5N1 flu was about to jump from birds into people. "Did we do anything to prepare, like make a new or better flu vaccine?" Osterholm asks. "No." We're not even making vaccines for viruses that we know are threats, that are regularly killing people, he says. "How are we going to convince people to invest money into a virus from the remote jungle for which we have no evidence that it has caused any human illness?" The next morning, we meet up with Olival at a quiet spot on the edge of the rain forest. He is going to show us what his team has found in all these bats and other animals in Borneo. He opens up his laptop and pulls up data from Malaysia. It's a bit eye-opening. "We've found 48 new viruses. And 16 that were already known," Olival says as he scrolls down a large spreadsheet. 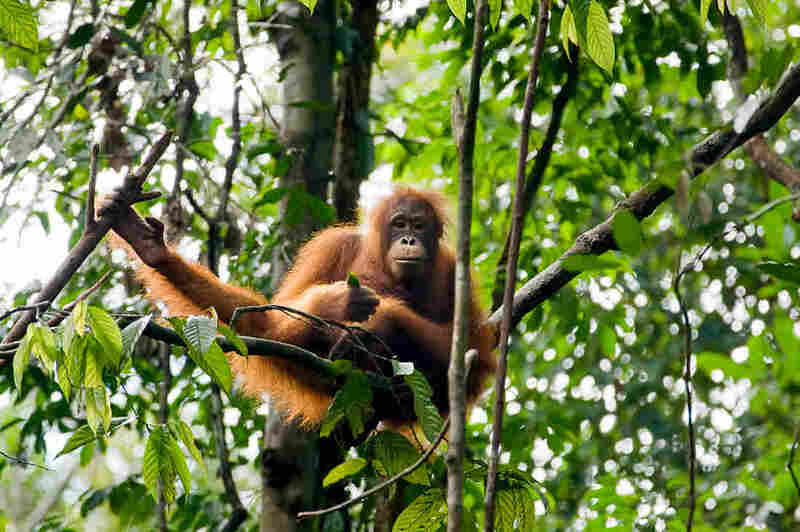 There's a new polio-like virus in orangutans. A bunch of new herpes viruses in monkeys, rodents and bats. And that's just in this part of Malaysia. "These viruses aren't 'new,' " he says. "They're just new to science. But not to the animals in the forest," he adds. All these viruses have been circulating in bats, monkeys and rodents for tens of thousands of years, maybe longer, he says, and no one has cared. No one has noticed. They're just a natural part of the ecosystem of the rain forest, coexisting with the animals, who are generally not harmed by the viruses. How do they become problems then? "Well, they don't magically jump out of the forest," Olival says. "It's because we are getting in there. Getting into the forest." To see what he means, we take a short walk from where we're sitting. There's a break in the forest and an overlook of the land below. And the view is incredible. As far as the eye can see are palm trees, row after row of oil palm trees. Nothing else. 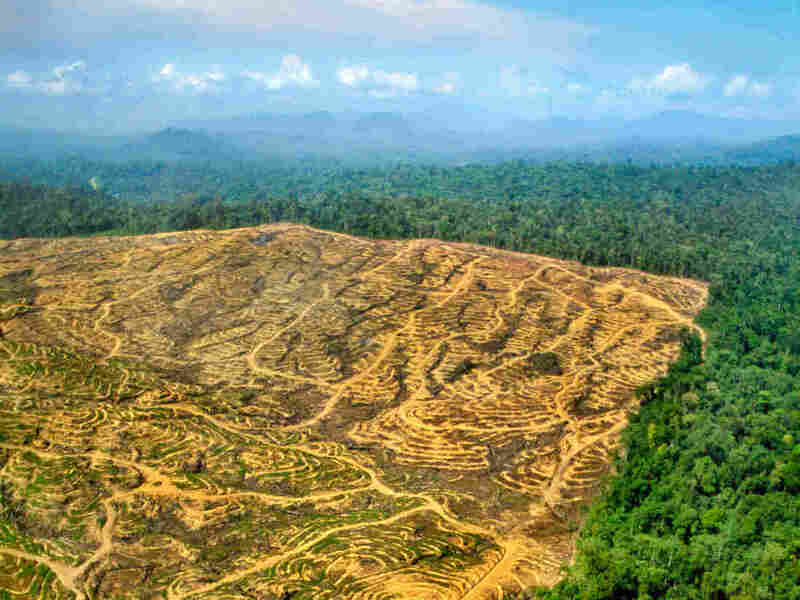 The rain forest has been eaten away by plantations for palm oil — you know, that inexpensive vegetable oil that is used in crackers, pizza dough, ice cream, even lipstick. Before the palm oil boom in the 1980s, this was all pristine forest. Filled with all these crazy animals and their viruses, Olival explains. But then people came along and started cutting down the forest. Destroying their homes. It's like puncturing a balloon filled with viruses, says Barbara Han, a disease ecologist at the Cary Institute of Ecosystem Studies in New York. "Whatever survives, spills out. Deforestation is closely tied to disease emergence." Opening Pandora's box: Once pristine rain forest in Borneo, the land on the left has been clear-cut for a palm oil plantation. Everytime people cut into forests, they create "edges," where people come into contact with animals — and their viruses. In the past 40 years, more than a third of the Borneo rain forest has been destroyed. 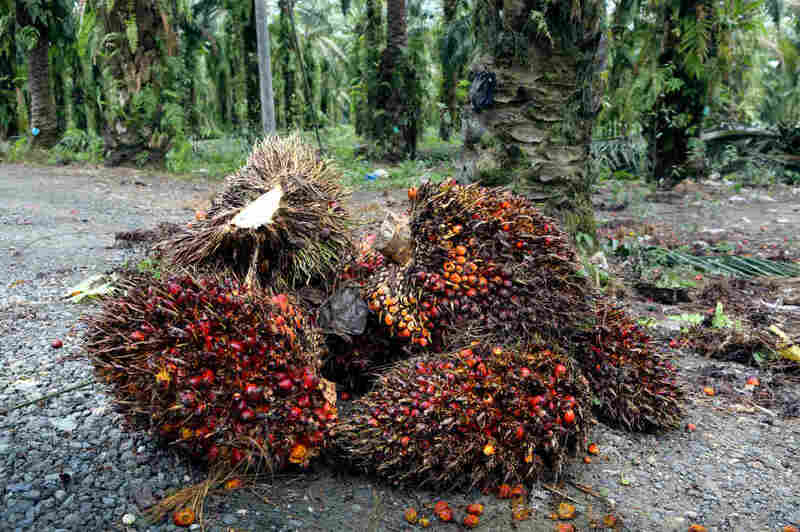 About half of that land has turned into palm oil plantations. A similar pattern is happening all over the world. By 2050, more than half of the world's population is projected to live in the tropics and subtropics, Han says. Right now, only 15 percent of the world's rain forests is still intact. The rest has been burned flat. Broken into pieces. Or converted into farms, ranges for cattle, metal mines — even shopping malls. "It's soybeans in the Amazon. It's suburban development in the U.S. Every part of this planet has been modified by people in some way," Olival says. "We're changing the environment in ways that are really unprecedented in human history." "So it's really the human impact on the environment that's causing these viruses to jump into people," Olival says. And cause an outbreak? I ask. Or a pandemic, says Olival.